← Tracy Crudup. The Mist of Mineral Springs. New York: iUniverse, 2004. Lisa Williams Kline. Winter’s Tide. Grand Rapids, MI: Zonderkidz, 2013. Stepsisters Stephanie and Diana have come to an uneasy truce over the last few years, but it’s still hard to get along. In Winter’s Tide, the fourth installment in the Sisters in All Seasons series, the girls face challenges within their two intertwined families and with each other. When a popular girl walks by Diana in the hall at school and whispers that hateful nickname all the kids call her, “annnnnn-i-mal,” under her breath, Diana finally snaps. Both girls are suspended for fighting just before Christmas, and Diana’s mom and dad couldn’t be more disappointed. Stephanie feels terribly guilty, since it’s her fault that Diana gets called “annnnn-i-mal,” but she’s worried that if she reveals her secret, Diana won’t understand that it wasn’t intentional. 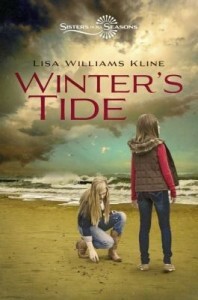 Both girls are distracted, however, when tragedy strikes Stephanie’s side of the family. First, Stephanie’s stepbrother from her mom’s re-marriage is driving drunk and gets into a car accident on Christmas Eve. Matt has always been mean to Stephanie, so she refused to say a prayer for him in church that night. Now this car accident feels like her fault, too. Next, Grammy Verra, Stephanie’s favorite grandparent, falls ill. Since it’s winter break, Stephanie, Stephanie’s dad, Diana, and Diana’s mom all drive down to Emerald Isle, North Carolina to stay near her. Diana is immediately entranced by the nearby animal life, including whales, horses, and even Grammy Verra’s dog, Jelly. When the girls meet a local boy, Jeremy, trouble begins: he takes them out on a secret trip on his dad’s boat to see the horses on Shackleford Banks, and everything goes wrong. Stephanie’s secret comes out, and the boat starts to float out to sea, potentially leaving them stranded. Will the sisters be able to reconcile, and will they find a way to get out of danger? If so, will Grammy Verra and Matt be OK? And will Diana finally be able to move past her bullies?